After our enjoyable foreign ride in 2011, Jim planned another ride on the continent for 2012. 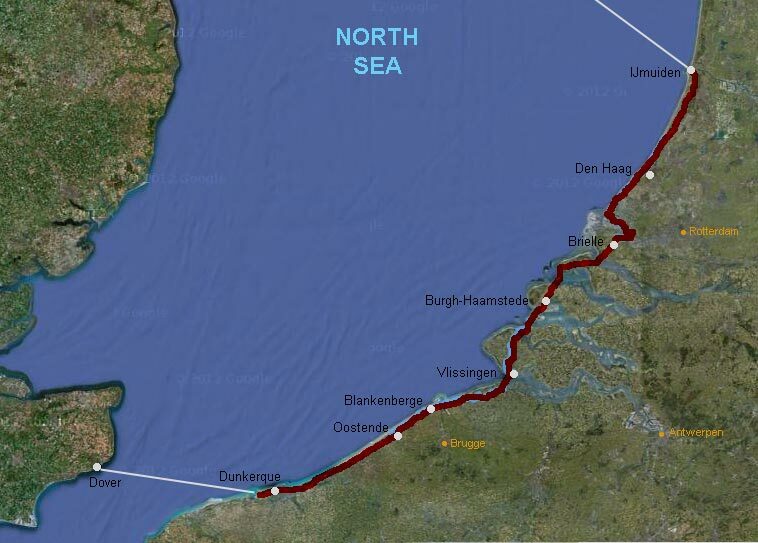 This was a 3-day trip following the coast from Dunkerque in France to ?muiden in Holland, about 200 miles (320km). This forms a small part of the North Sea Cycle Route, a 6000km circuit which extends to Bergen in Norway, although we weren't concerned about sticking rigidly to the designated route. The ride began on the last Friday in June, and the weather forecast for the three days promised a following wind, generally sunny but with the chance of some showers. The riders this year were Jim, Brent, Ian and myself. An early start was required in order to ensure we caught the ferry from Dover, so we all travelled on the 06.00 from York to King's Cross. This arrived in London on time, and we wheeled our bikes across the road to St Pancras for the high-speed train to Kent. Rather than wait for the 10.10 to Dover, we decided to catch the 09.40 to Ashford and change trains there, which gave us a bit more time in hand in Dover. On the way from Dover Priory station to the Eastern Docks, we spotted a café and decided to call in for a proper breakfast. The roads to the Docks were busy with heavy traffic, but we all got there in one piece, checked in and joined other cyclists in Lane 110 to await boarding. We joked that the steep ramp up to the ferry would be the last time on this ride that we would need a low gear. The crossing was smooth despite the strong breeze from the southwest, and we docked in Dunkerque on time at 15.00 local time. The first part of the ride took us through the industrial zone, with fine views of chemical works, steelworks and the like. A long straight along the sea dike brought us close to the old town of Dunkerque, although we didn't go into the centre. We followed a road slightly inland from the coast to Bray-Dunes, and crossed the border into Belgium about 90 minutes after leaving the ferry. From Middelkerke we cycled along the Zeedijk (promenade), and with the tailwind, a good surface and not too many pedestrians to get in our way, this provided some fast cycling for a while. In Oostende, we needed to come away from the coast to cross the canal, and once again the tramway acted as our guide. Even though there wasn't much further to go to our destination, we decided to stop in Bredene, as we hadn't had a break since leaving the ferry. We were able to sit outside a café and enjoy our cappuccinos in the evening sunshine. We continued to follow the tram lines right up to our hotel in Blankenberge (the Best Western Richmond Hotel), where we arrived shortly after 8 o'clock. We were shown to a garage where our bikes were locked up for the night. After showering and changing we reconvened in the hotel bar. I had a list of 3 bars taken from a Belgian beer guide, so we decided to go to the nearest one, Café Terminus. It seemed to be in darkness, so we went to the next one on the list, Café Au Luxembourg on the sea front. The town was surprisingly quiet, most unlike a Friday night in any British town. We each had a glass of Rodenbach beer there, but they didn't serve meals so we left and went in seach of food elsewhere. We found it at the Jet Set takeaway, where I had a "saté" (kebab), fries and "Américain" sauce. We called in at another bar opposite the hotel for a final beer (or two) before bed. The hotel did a good PYB (pig yourself breakfast) so we were able to take on plenty of calories ready for the long ride ahead. We were on the road by 8.40, and opted to follow the tram route to its terminus at Knokke, rather than dodge the pedestrians on the promenade. Once we had passed the end of the tram lines, we relied on the green-and-white cycle route signs for navigation, and these led us along some minor roads and then an off-road track to the Dutch border. We came to a road with no signpost, so we needed to consult our maps to work out a route to the Breskens ferry terminal. This took us through the villages of Retranchement, Nieuwvliet and Groede, and we arrived at the ferry terminal at 10.30. Just after we arrived, a hundred women cyclists appeared on the Ladies-only charity ride, and they all got on the next ferry while we were still buying our tickets. We waited for the next departure (at 11.18) and boarded, along with many other cyclists. In fact, most passengers were travelling with a bicycle, and most of the lower deck of the ferry was taken up with cycle storage space. The 20-minute crossing brought us to Vlissingen, and from here we started off by following "North Sea Cycle Route" signs. After going for some distance without seeing any more signs, we came to the conclusion that we must have missed a sign somewhere, so once again we resorted to the map. It took us a while to work out where we were, but fortunately we weren't too far off our planned route. This part of the ride crossed a number of former islands now connected by dams or flood-protection barriers. The first of these was the Veerse Gatdam, which took us from Walcheren onto Noord Beveland, closely followed by the Oosterscheldekering (Eastern Schelt Barrier) across to Schouwen-Duiveland. Although we were following the main N57 road, a completely separate cycle lane kept us clear of the traffic. We called for lunch at Sonnemans Bakery in Burgh-Haamstede, which had featured in a recent "Hairy Bikers" TV programme. With a sandwich, a cappuccino and a "bolus" (a very sweet doughnut-like confection) inside us, we carried on to the Brouwersdam, where an open air concert was taking place (Concert at Sea). This had closed the cycle path we were using, and the N57 road, but we were directed to another cycle path on the opposite side of the road. This led us over the dam to the next island, where we stopped for an afternoon coffee in the village of Ouddorp. The final leg of today's ride was over the Haringvliet Barrier to the former island of Voorne and the historic town of Brielle, where we were booked for the night in the Bastion Hotel, on the edge of the town. We walked into town and had an excellent meal at 't Kont van het Paard, which translates as "The Horse's Arse". We then moved on to Honky Tonk Bar for a few more beers, and enjoyed the live music by Jozzies 5. The final day's ride got underway just after 9 o'clock, but our plan of following the "moat" around Brielle led us to a dead end. We found the correct route and followed it to the ferry terminal at Rozenburg. A ferry was just arriving, so we didn't have long to wait for the short crossing to Maassluis. A bridge closure required a (well-signposted) diversion through the centre of Maassluis, and then we returned to the waterfront. The next few miles were the only part of the ride where we needed to work hard, as we headed west to Hook of Holland, into a strong wind coming off the North Sea. In Hook of Holland we turned the corner and resumed our north-easterly bearing along an excellent cycle track. With the wind now behind us we were able to maintain a good speed. It was busy with other cyclists, ranging from young families out for a leisurely ride, to keen racers who silently came up behind and whizzed past us. We stopped for an early lunch at a café in the seaside resort of Kijkduin, then continued along the coast. 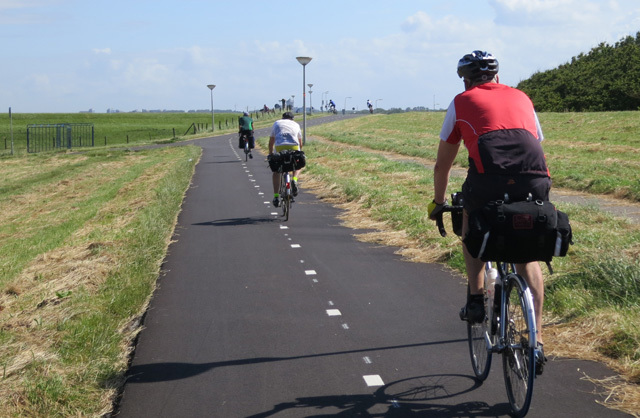 We had to rejoin roads with traffic through Scheveningen, but beyond there a separate cycle route re-appeared and took an undulating route through the sand dunes to Katwijk. A short on-road section here was followed by another stretch through the dunes to Noordwijk, where we called at a café on the beach. From Noordwijk the route continued as a cycle path through the coastal dunes. A path to the left was signed as "fietspad" (cycle path) but as the main route carried straight on, we ignored the sign. A couple of km later we came out unexpectedly on a main road, and it took us a few minutes of studying the map to work out where we were. We had to retrace our route for about 5 minutes and then turn right to get us back on track. Clouds had built up during the afternoon and produced a brief shower at this point. We were back on roads again through the seaside resort of Zandvoort, but north of there reverted to cycle paths which took a convoluted route towards our final destination. We had got this far without any breakdowns, but Ian deprived us of a clear run by getting a puncture about 3 miles before the end of the ride. It was quickly fixed and we arrived at the ?muiden ferry terminal with plenty of time to spare. We were booked in a 4-berth cabin which didn't have a lot of space, so once we had dropped off our stuff we settled ourselves at the open air bar on the top deck while taking it in turns to get showered and changed. After one drink we decided it was too windy for comfort there, so we went down to the sports bar where we were able to watch the end of the first stage of the Tour de France before dinner. Dinner was an "all you can eat" buffet, which we had booked in advance. There was an enormous choice of dishes, too much even for us hungry cyclists to sample everything. After dinner we retired to the main bar, where a group were playing rock and pop classics. Their repertoire was going down well with the crowd, which contained a large number of motorcyclists. We docked on the river Tyne near North Shields at 9 o'clock, but our deck was the last to disembark, at about 10, following a noisy departure of all the motorcycles. We then spent a further 20 minutes queueing for passport control. As we had the whole day at our disposal, we had decided to do some cycling rather than catch the first train home, but it proved to be a disappointment compared with the excellent cycling we had done on the continent. We crossed the Tyne on the ferry to South Shields, followed the coast to Sunderland, then used NCN (mostly off-road) routes to Durham. Brent suffered 2 punctures, and it started raining quite heavily, so we were glad when we reached Durham station. We had coffee and cakes while waiting for a train that we could all get our bikes on, and on arrival at York celebrated with a pint in the York Tap.